Objectives: Acoustic repertoires may serve as a central component for social cohesion, foraging, and reproduction; in turn, these sounds may reflect population or species boundaries for many taxa. As acoustic monitoring has increased in popularity, so has interest in using this data to identify population structure and quantify biological diversity. In cases where it is difficult to obtain other biological samples, acoustic data may be the only source of information from which population structure can be inferred. Historically, acoustic research on different taxa has proceeded independently, utilizing different features and developing different methods for classification or quantifying regional differences. Additionally, while it is clear that there is a genetic component to some bio-acoustic features, the degree to which they are shaped by the environment or can be used as a proxy for relatedness is still uncertain. 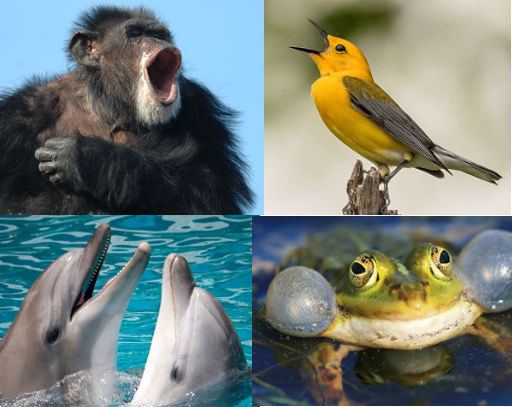 In order to make progress on the promise of using acoustics to characterize population structure, this workshop brought together experts in bio-acoustics of multiple taxa, including birds, frogs, primates, and cetaceans, with mathematicians and computer scientists with expertise in classification, clustering, and information theory to develop a unified approach. This was accomplished by: 1) compiling guidelines of best practices for designing acoustic surveys, 2) reviewing acoustic features of each taxon useful for identifying regional and taxonomic differences, and 3) reviewing methods for quantifying and comparing information content, generating classification models, and identifying biologically significant clusters. The results of this workshop described the current state of using acoustics to assess population structure, created a community bridging taxonomic disciplines, and provided new non-invasive tools for conservation. Presentations were available for viewing via live streaming during the workshop and selected recorded videos of these presentations are now available for viewing. Summary Report. The workshop was initialized with a series of six 15-minute talks that outlined representative issues in studies aimed at examining acoustic structure in biological systems; these issues were further discussed after each talk. The full group then spent the remainder of the first day outlining fields of inquiry that bioacoustics is aimed at addressing, tasks common to most projects, and key components of the bioacoustic workflow. We also brainstormed on resource or infrastructure gaps within the bioacoustic community that our group might be well-suited to draw attention to. This led to a partitioning of overarching topics covering Survey Design, Annotation, Feature Extraction, Machine Learning, and Interpretation of Results; these were then addressed in more detail by subgroups. The second day ended with reports back to the main group of the subgroup discussions. On the final day, the subgroups met briefly to discuss potentials to merge and solidify the scope of their products. In the wrap up meeting of the full group, there was consensus of the value in writing an interrelated set of three to four papers. These papers will serve as an entry point to the literature, providing an overview and prospectus for new bioacousticians or non-bioacousticians. Many newcomers to the field have reported a lack of a guide as to where to start and how to proceed. The papers will cover critical issues relative to the design of surveys and data collection, data processing and analysis, and the interpretation of results. The attendees also recognized the importance of highlighting future needs in bioacoustics, from hardware requirements, to the collection of necessary contextual information on the environment and behavior, and more complex analytical capabilities for integrating multiple data streams, as well as human and machine learning input. Finally, the gathering of this diverse group of researchers fostered an array of promising collaborations and highlighted the need to further develop an online community to address mutual needs and to provide a technical forum for software questions. NIMBioS Investigative Workshops focus on broad topics or a set of related topics, summarizing/synthesizing the state of the art and identifying future directions. Workshops have up to 35 participants. Organizers and key invited researchers make up half the participants; the remaining participants are filled through open application from the scientific community. Open applicants selected to attend are notified by NIMBioS within two-to-three weeks of the application deadline. Investigative Workshops have the potential for leading to one or more future Working Groups. Individuals with a strong interest in the topic, including post-docs and graduate students, are encouraged to apply. If needed, NIMBioS can provide support (travel, meals, lodging) for Workshop attendees, whether from a non-profit or for-profit organization.